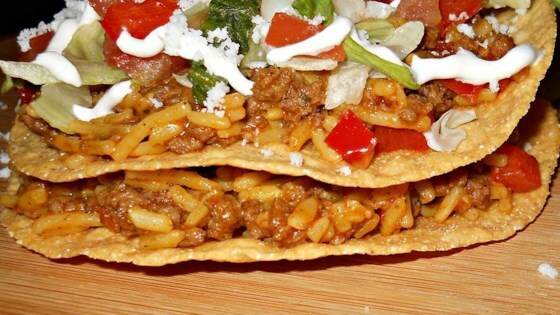 "Knorr® Fiesta Sides™ - Mexican Rice combined with seasoned ground beef and red bell pepper are stacked on crispy corn tostadas and topped with lettuce, tomato, queso fresco and sour cream for a delicious dinner that even the pickiest eaters can customize to their liking." Brown ground beef in a medium sized pot until it is crumbled and no longer pink. Remove browned beef with a slotted spoon; set aside. Pour off the fat. In the same skillet, prepare Knorr(R) Fiesta SidesTM- Mexican Rice according to the package directions. Add browned ground beef and diced red bell pepper. Mix well. Divide the mixture among 12 tostada shells. Stack them 2 high making 6 double-decker tostadas. Top with shredded lettuce, tomato, queso fresco, and sour cream. These Fiesta Tostadas are easy to assemble and a variety of toppings can be added depending on what you have available. Ground beef can be easily swapped out for seasoned shredded chicken as well. We have a weekly Mexican night where we will make tacos and nachos that can be easily customized depending on what we have on hand or what everyone wants that night. I'm always looking for ways to change up our old standby meals and this is a great alternative. Simple to make. My family loved it! I wasn't sure as I read the directions when to add the red pepper, so I just added it as the rice was cooking. Turned out great.